Rheumatic connective tissue diseases are inflammatory (inflammatory), autoimmune conditions in English called "autoimmune connective tissue diseases / disorders". Typical examples are Systemic lupus erythematosus (SLE), Mixed connective tissue disease (MCTD), Systemic sclerosis / scleroderma, (Dermato-) myositis , Sjögren's syndrome and overlapping diseases like Skleromyositis and og undifferentiated systemic connective tissue disease which are discussed on separate pages. Hereditary (genetic) connective tissue diseases are another type, more rare diseases that are discussed further down this page. 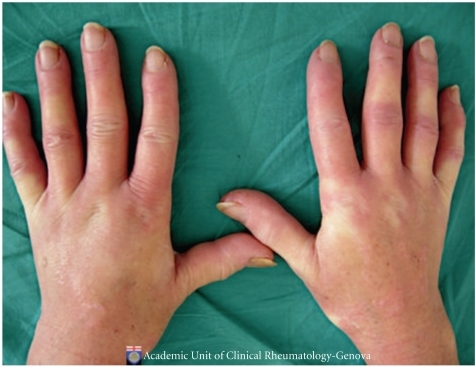 Autoimmune, systemic connective tissue disease (and Vasculitis diseases) may be mild or severe conditions within the consept of rheumatism ("Rheuma") and the profession Rheumatology. They are characterized by rheumatic, autoimmune inflammation of connective tissue and often attack internal organs. The connective tissue is located around the organs, but is also a part of them. The diseases are also referred to as collagenoses or connective tissue inflammation. They may include skin, joints, internal organs. The connective tissue is made of the proteins collagen ("Collagenosis") and elastin that bind the different organs of the body together. 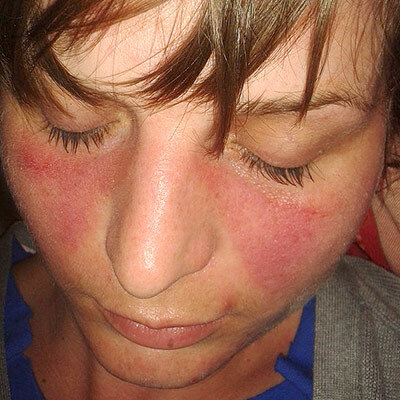 Systemic Lupus (SLE) with rash on ears, cheeks, mouth and fingers of a young girl. Huang CF, Ann Dermatol, 2011, Dep of Dermatol, Tri-Service General Hospital, Taipei, Taiwan. Triggers of autoimmune connective tissue disorders are still unknown. Women are more often attacked than men, which may be due to the X chromosome (women having two, men one) containing over 1000 genes, while the man's Y chromosome has about 100 genes, and many of the genes on the X chromosome are linked to autoimmune. diseases. Genetic predisposition and a more complex immune system among women are only partial explanations. Younger people are often the most affected, probably because their immune system, which is central to the disease mechanism (see more below), is most potent in younger years. Once a systemic connective tissue disease has started, the immune system will overreact with excessive activity. By mistake, the immune system attacks the body's own proteins and tissues (autoimmunity). Nobel prize winner in immunology, Paul Ehrlich, described in his time the significant problems that may occur as "Horror autotoxicus". The various connective tissue disorders (diagnoses) are differentiated because the immune system triggers different Antibodies and damage different organs. It was previously said about rheumatic diseases that "No other group of diseases causes so much suffering for so many over so long time". Fortunately, the treatment options have developed significantly since then, something you can read about on the various pages via the menu here. Newer medications and proper handling save a lot for serious disease development, pain and disability, but for a few of the systemic connective tissue disorders, the statement is unfortunately still striking. 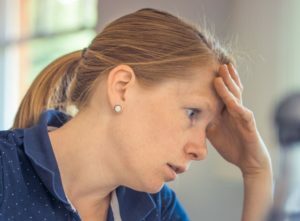 What is fatigue (exhaustion), Fibromyalgia, ME (Chronic Fatigue Syndrome)? What is meant by arthritis or synovitis? How do I prepare for the medical consultation? Information on indication of the drugs and the risk of side effects are important by each treatment. The treatment should suppress the overactive immune system so that kidneys, lungs and other internal organs retain their function. At the same time, the symptoms should be reduced. Cortison (for example prednisolone) is still used in addition to many new drugs. Cortisone can be decisive in the first and most active, destructive disease stages, but must be avoided at Systemic sclerosis. Other medications (for example Plaquenil, Methotrexate, Azathioprine) are added to avoid much cortisone side effects and to keep the disease at bay. Against pain is paracetamol formulations usually the first choice, followed by NSAIDs. The treatment goal is often that the disease goes in remission. Before starting treatment it is important to be aware of the disease, what the treatment goal is and what side effects may occur. Connective Tissue disease Systemic sclerosis / scleroderma with hoarse fingers. Cutolo M, 2014. Open-in. autoimmune connective tissue disease. For research tasks, patients are included in a disease register: Norwegian systemic connective tissue disease and vasculitis register (NOSVAR). In recent years, the register has contributed to more than 70 published works in international medical journals. PhD (doctorate) work has been completed for the following diseases: MCTD, Systemic sclerosis, SLE, Myositis, Antisynthetase syndrome, Takayasu arteritis and more new work is underway. The good collaboration between patients, doctors and researchers is crucial for obtaining new knowledge for the benefit of the treatment. The pages of this site are written by a doctor and specialist in rheumatic diseases dr. Med. Øyvind Palm. The information is intended for Norwegian users. The content should be reliable, but it is not guaranteed at all times that it is available, complete or accurate. The owner and author of the pages therefore disclaims any responsibility for errors and omissions on the website, for any errors and omissions on the pages that are links to and for the content of the advertisement. For translated pages, please note that the computer-assisted translation means that errors can occur. Blau syndrome / juvenile sarcoidosis "juvenile systemic granulomatosis"